New York Review Books has published this Swiss classic just in time to be part of our creepy Halloween lead up. Gotthelf is actually the pen name of a Swiss pastor, Albert Bitzius, who published the original in 1842, though it didn’t get its first English translation until 1957. I was particularly intrigued to read this short book when I learned that it had been newly translated by Susan Bernofsky, who did such a terrific job on the Berlin Stories of Robert Walser. The novella begins benignly enough. A great bustle has commenced at a beautiful Swiss farmhouse as preparations for a baptism begin. Food and drink are to be had in abundance and yet there is much anxiety as well that all should go according to plan. The young godparents have been entrusted with a sacred responsibility for this infant and it is perhaps with awareness of this that the grandfather is finally persuaded to tell them the purpose of an old black post that has been embedded in this newer house. It turns out things did not always go so well in this idyllic setting. The people in the story are (deliberately) more types than well-rounded characters, for Pastor Bitzius has a moral purpose in mind here. His motto, simply put, might be “Choose God.” Or, for our times, “choose good”. There is not much gray area in his thinking. Over at our Good Reads discussion, I have been pretty vigorously “misreading” him, as his most fleshed out character, Christine, is a kind of Eve in his schema, and yet to my mind, she is pretty much the only person with a backbone in the book. There is definitely a “women should know their place” undertone to parts of the story, which has rubbed some readers the wrong way, but I was rather delighted to find that the bravest character in some way manages to elude the intentions of her author—though, of course, not entirely. 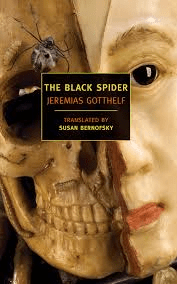 Whether you’ll find The Black Spider a really frightening read probably depends a lot on your relationship with spiders. If you’re a true arachnophobe, you might want to skip this book. (Although Bernofsky says she is, and she did not shirk the task.) As for the rest of us, fear not. There are other pleasures to be had from this novella besides those of the spinetingling variety.